For over 50 years, MICROMATTER has earned a reputation for quality. Today, leading institutions in over 50 countries use MICROMATTER standards to calibrate their X-ray fluorescence (XRF) systems. MICROMATTER standards are most often used for instrument calibration and quality control in the fields of air pollution and thin coatings. They are also useful as a source of pure element spectra for use in background subtraction routines, and as a routine check of x-ray detector resolution and overall system performance. All MICROMATTER standards are prepared by vacuum deposition resulting in a highly uniform deposit. In most cases the standards present an element free of interferences and are thin enough to ignore thickness effects. Where it is necessary to use compounds or semi-compounds, the companion elements are chosen to minimize interference and provide stability. While high-purity is not critical in these thin films, materials used are 99.9% pure or better. Certification is provided for each calibration standard. The areal density of each deposit is determined by precision weighing and/or verification by XRF spectrometry. Our standards are certified to ±5%. Custom thicknesses are also available. 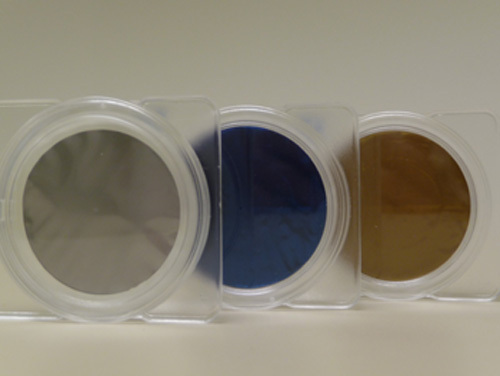 MICROMATTER manufactures thin film standards for most elements of the periodic system. Please consult the XRF Ordering Information Sheet and the Quotation Request Form for details.